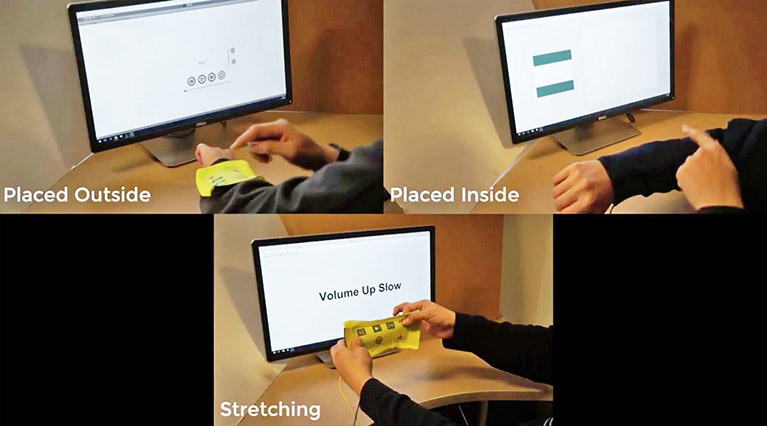 Purdue University recently developed iSoft, a technology that attaches to everyday objects as wearable technology. iSoft is customizable, and it could help industries ranging from health monitoring and athletics to virtual reality. iSoft turns everything into a controller, allowing real-time control over digital devices. Users can create their own personalized sensors. iSoft could figure largely in the future of technology and wearable technology. Discover the possibility of a future where users can browse and experience websites through customized controls. With the advent of smart mobile devices, an arms race of sorts has been waged to make the platforms more convenient, functional, and innovative. Some aim for bigger phones, others aim for wrist devices, and yet more go a step farther and try to meld the technology into what people are already wearing. The allure of this kind of technology isn’t new; comic books popularized the idea in the 1930s, and TV and movies carried that torch into the new century. First came Bluetooth devices, followed soon by smartwatches and web-capable eyewear. The market for wearable technology is growing. Levi’s jeans and jackets can now be purchased with built-in connectivity to the internet and haptic interaction with compatible devices is one fascinating example. Some studies indicate as much as 20% of people now make use of some form of the wearable device, with industry leaders like Apple ordering more and more of their wearable technology, the Apple Watch, even before release because of high demand. Another phenomenon grew alongside this push for more convenient technology – the application store. With more people entering this new and innovative market, people found plenty of things they could try, often for free, on their new technology. Mobile technology, up to this point, always requires certain common components – batteries, screens, ports for charging and headphones, speakers, and various buttons. Form factors in mobile technology don’t change that much, which makes starting on what already works the go-to-market for finding that next big money-making device. Enter iSoft, a new kind of technology built into the clothlike material. It can sense several types of stimuli, such as taps or continuous physical touch. It acts in real-time, can operate in a multimodal mode, and is fully customizable upon delivery, meaning you can make your own soft sensors. You don’t even need to have the professional knowledge to do so. The designer made this type of sensor to track and measure movement, a complicated task when one considers the complex contours of the human anatomy. To function correctly, this kind of sensor needs to be able to adapt and conform to the input it receives. The sensor lacks wiring and electronics, relying on a “piezoresistive elastomer” (a carbon silicone rubber) that alters electrical resistance when touched to give sensing information. The technology accomplishes this by means of electrical impedance tomography techniques that determine alterations in resistance distribution in skin contact with the sensor. To compensate for any delays caused by echo resistance occurring as the elastomer reforms its shape post-contact, the developers created an algorithm to create an active baseline that updates as needed. By making this algorithm, the team ensured constant interactivity through the interface while it reforms itself. How this technology will alter the market going forward is still unknown, as the patent for iSoft was only recently filed. Still, one need only look at the mobile device and how it transformed the marketplace to see a close comparison. These devices altered the way people interact with the internet, compelling companies to keep pace. Big search engines made moves to drive mobile websites to the top of searches conducted from handheld devices, with Google stating publicly this change had more far-reaching effects than previous algorithmic updates. Mobile-friendly websites once hardly existed; now, if you aren’t catering to the mobile user, your business is losing out on a lot of potential traffic. That’s not even considering what wearable traffic you might miss. The data doesn’t lie. Over the past several years, a specific site was tracked to see what kind of traffic the company saw and what changes occurred. Desktop site traffic held its ground, seeing very little consistent growth beyond spikes. Even though overall traffic climbed an average of 20%, none of that came via desktops. Mobile visitors drove the growth, either through handhelds or tablets, and they now constitute more than 45% of that site’s traffic. This type of shift in traffic could happen with wearable technology. It’s safe to assume that big players like Apple will put as much into promoting this kind of technology as they did into their mobile and tablet branding. Where once people had no ability to do something as important as work on joint projects or manage your bank accounts while riding a train, now they do it all the time. The form factor of wearables will compel developers to adapt yet again. The smaller screens on Apple Watches forced app creators to cut down what they presented to the wearer to the absolute bare minimum elements. Onscreen keyboards are out of the questions for such devices, so voice technology becomes paramount once people get over being seen talking to their watch like they did when it looked like they spoke to no one at all when using a Bluetooth headset. This will compel developers to improve the conversational adaptation of voice recognition software and the algorithmic processes search engine computers use to match search queries to the potentially longer verbal searches. A robust synonym query system, combined with increases in co-citations or site references, will be critical elements in the success of this shift in user interactivity. If the user gets frustrated with the voice query, they’ll stop using it, and there goes the investment in the technology. The same will hold true for a wearable sensor like iSoft, at least at the outset. Imagine trying to type one-handed into a flexible sensor on your arm. You could take it off, but why not just use a Bluetooth keyboard at that point? However, using your fingertip to write notes down, much like using an Apple Pencil or similar device with a tablet, becomes a viable option. Applications for use of wearable technology will require further adaptation. Developers will have to adjust for screen types and sizes as well as the type of sensor being used, much as they’ve done with smart devices and the limited wearables so far. As more wearables enter the market, the new traffic will drive developers to innovate and adapt to capture the new market by giving users apps they will grow to love – beyond just a search engine to find the content they desire. Integration of the platforms, allowing a user to start on a wearable device before flinging it to a tablet or a desktop computer, will also help customers buy into the technology. Apple proved this with the Apple watch, showing how the device could create the entry point for a wearer that led to another device for the end result. As an example, a user could use a wearable app to search for an event to attend and have the website used to make the initial query connect to the wearable app data. This eliminates reentering data and accelerates the user’s progress, giving them a satisfying cross-platform experience sure to drive them back to the wearable app. Not everyone will use wearable technology. Not all users will like the form factor, and many businesses won’t see the return on investment necessary to go beyond mobile traffic. However, wearables offer something new for the market to use, meaning the innovative company will at least be aware of what it offers and what it could bring to the user experience.